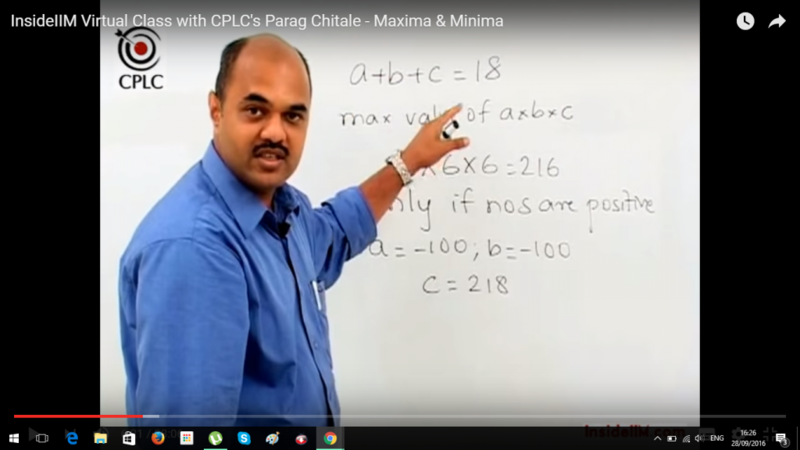 In this video, the systematic manner in which Prof. Chitale deconstructs the problems makes quantitative aptitude seem ridiculously simple. Our only request to you is to please share it with as many people as possible out there. There are thousands of students who do not have the privilege or ability to join expensive coaching. Our mission is to make it a level playing field. Please ensure every needy student gets access to this. I watched the maxima minima video that you posted and found it to be of a great help! Especially for someone who’s working and does not have time to go for coaching classes.. I checked your youtube page after that and found many other quant topics. I need a big help in logical reasoning for NMATand CAT, especially questions that involve making grids or tables with more than two variables..
Could you please help me with some videos on how to solve such type of logical reasoning questions, it would certainly be of great help. Cat is 20 days away and I’m too scared! I have mailed you about the same.